Wow, I’m totally embarrassed that it has been 6 months since I talked to you guys. Working nights is totally messing with my ability to get much else done besides basic chores! I haven’t touched the spinning wheel in months despite a couple of big projects that really need to get done. The only knitting is happening at work between calls, and very little of it. The good news is that I still am working, and I am grateful for that. Office politics is a killer for me, as it is something that I totally don’t “get”. I don’t understand why any workplace would not only allow behaviors that are counter-productive but seem to encourage them. My mantra has become “Not my circus, not my monkeys”, and I have to tell myself that several times a shift. I enjoy the actual work, so that’s what keeps me going. On the farm-front things are going well. I had quit milking when Mom had her knee replacement, there being only so many hours in a day, but Clara was still nursing, so after a 6-month hiatus I forcibly weaned her yearling sons. They were not impressed by my efforts, especially O’Dell. He nursed her through the fence when I moved her next door to the boys pen, and when I set her up further away he would break out and find her! He is now living on a tether in the boys pen, which is not ideal but will have to do for now. The first few weeks were slow going, averaging about 12-18 ounces a day (2 milkings a day). But even little bits add up, and by the end of April when I added up the totals she had given me almost 6 1/4 gallons. I just ran May’s numbers this morning, and the grand total was 12.43 gallons! She is now averaging 54-57 ounces a day, and I am very pleased with her progress. All this milk means I have gone back to cheese making. I figured out the Clara was the source of the failures I had been having, so I have had to make some changes. For some reason her milk does not take well to being heated (I suspect a sub-clinical infection, since her boys were so rough on her udder. When I am ready to dry her off I will give her a course of antibiotics). So mozzarella and ricotta are out of the question, and I have moved on to an Iberico-type. It only has to be heated to 97 degrees. 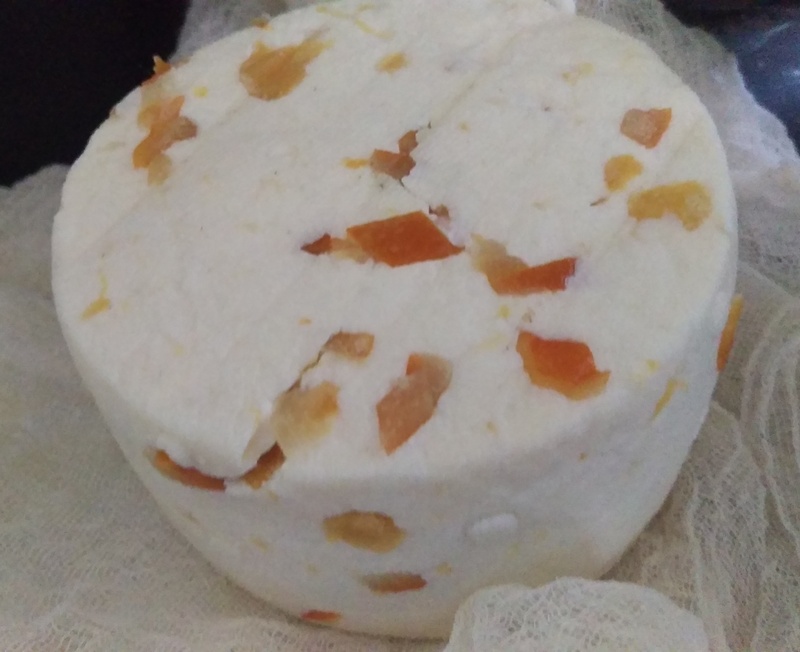 I got my mojo back making a Manchego with some sheep milk I bought from a friend. Still haven’t broken in to any of them, so the cheese cave (aka veggie drawer in the big fridge) is filling up. I chopped up some of the salt-preserved Meyer lemon I made last year and stirred it into one batch. Sure is pretty, don’t you think? At the beginning of May I also got a half-dozen turkey peeps. Four broad-breasted Bronze, and 2 Chocolates (a heritage breed that will be capable of reproducing if it turns out I have a pair). A month old now, it is amazing how much bigger the Bronzes are already. They are a precocious lot, intent on escaping the safety of the barn where I have been brooding them. Almost from the very beginning, I occasionally come out to one or more out with the sheep, who thankfully have been very gentle with them. 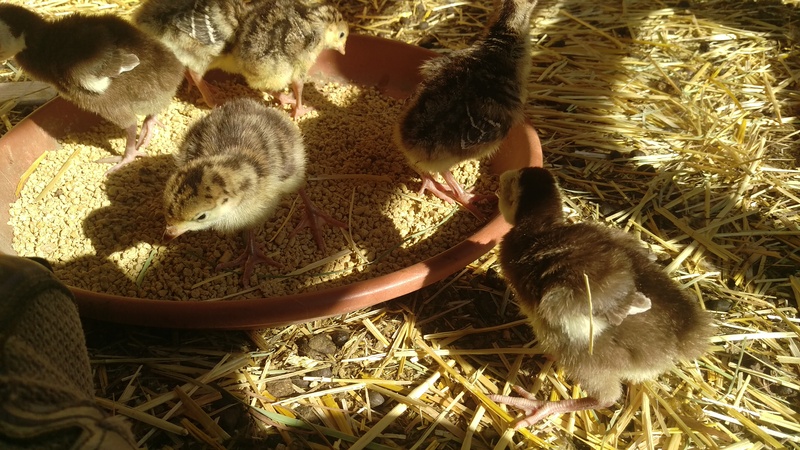 I have been unable to convince them that the big, wide world isn’t a safe place for little turkeys, so I need to figure out where I am going to put them to grow out. I will mean building something for them, since all the pens are occupied at the moment. All the duck hens are sitting on nests now, so if they all hatch out I will soon be up to my armpits in ducklings. One of the Muscovy girls was not happy with being in the pen and has made herself a nest in between the pole barn and the chicken coop, between some old windows. It is fairly safe, so I will wait for her ducklings to hatch before I move her back to the pen. She went broody about 2 weeks before the other Muscovies, so the move should be interesting. The crazy ducks all went broody at roughly the same time, so fingers crossed that I get ducklings from them. Breeding them to the Muscovy drake is an experiment. Being different species, any babies will be sterile mules (generally called Moulards); they should grow fast and are all destined for freezer-training. The hens seem dedicated to their nests, and I haven’t seem them rejecting any eggs (which they will often do with infertile eggs). I’m pretty sure that the hen that hatched out a brood last year had a few Moulards in the mix, since there were ducklings that didn’t hatch out that weren’t quite mature when their litter mates hatched (Moulards take a longer incubation period). I am cautiously optimistic at this point, but only time will tell. If it doesn’t work, I will have a lot of rotten eggs to add to the compost bin. I have started a lot of seeds under lights in the kitchen, and a few things have been moved outside to the garden. The spinach that volunteered has been going gang-busters but is bolting now. I have been pulling stalks to feed to the beasties, but will let some go to seed again since that is so easy. We have had a cool, wet spring, so grass and weeds are growing and threatening to take over the place. I have taken to using the scythe a few minutes every time I go out to milk and feed. In under 5 minutes I can cut enough to give everyone a healthy addition to their diet, and I am slowly clearing the pasture. Lots of mustard, plus grass and dandelions. They prefer it fresh-cut, and since that is easier on my back I am happy to oblige. It isn’t the cutting that gets to me, since the scythe is very ergonomic, but the gathering and delivering of the goodies is work. That’s it for now. Hopefully I’ll get back here before the New Year. It isn’t that I don’t have anything to say; it’s just having the energy when the words are flowing. Take care!